Wordy Wednesday: Yahoo for Food! Louise actually was hungry yesterday. That is such good news since she has been refusing food for weeks now due to pancreatitis. Maybe it was the yummy lean turkey, rice, pumpkin and mixed veggies that I made. Whatever it is, I am so glad that she is taking an interest in food. She actually was jumping up at me, which is her playful way when I am taking her bowl to the mat. 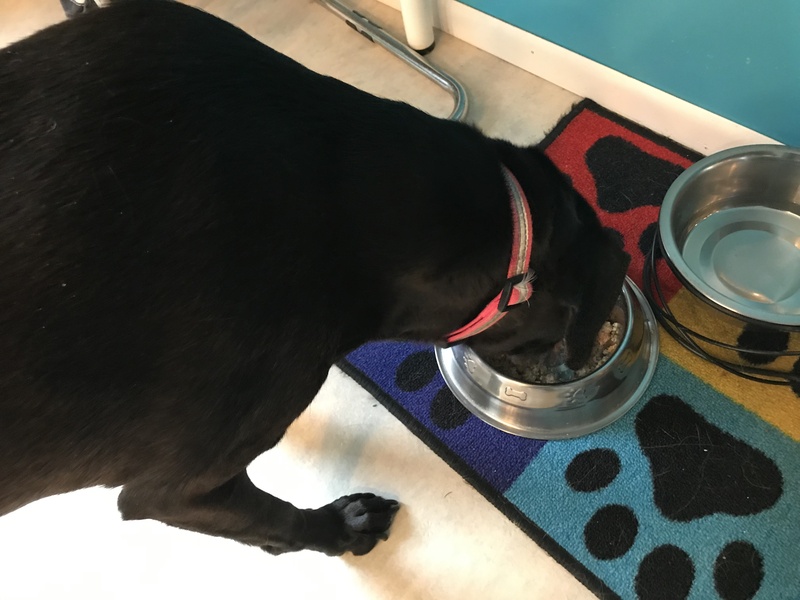 Nothing can make a Parent happier (whether dog or human) than to see them eat after they have been sick. She misses her kibble though. This mushy stuff goes down real quick. Should I try to go back to some commercial dry? And how do I make sure of all the supplements that I should put in my homemade stuff? I am no dog nutritionist and this is becoming a huge experiment (digestive enzymes, fish oil, vitamin E, coconut oil, B12, selenium, vitamin C, beta-carotene, and methionine to name just a few). For years, I have had the feeding of my 7 animals, with 8 different foods, down to a science, but this has now thrown me for a loop because it is going to be long term. Do I move all the dogs to the homemade diet once I figure out the complete mix? Do you cook for your pup? How do you get the right stuff in the mix? Do you have multiple animals? Do they all eat the same thing?